Why Elms for your Chemistry degree? Conduct original research and present your work at STEM conferences. Work with state-of-the-art equipment in the Lyons Center, a $12 million facility for natural and health sciences. Explore the ethical applications of chemistry through our bioethics and medical humanities minor. 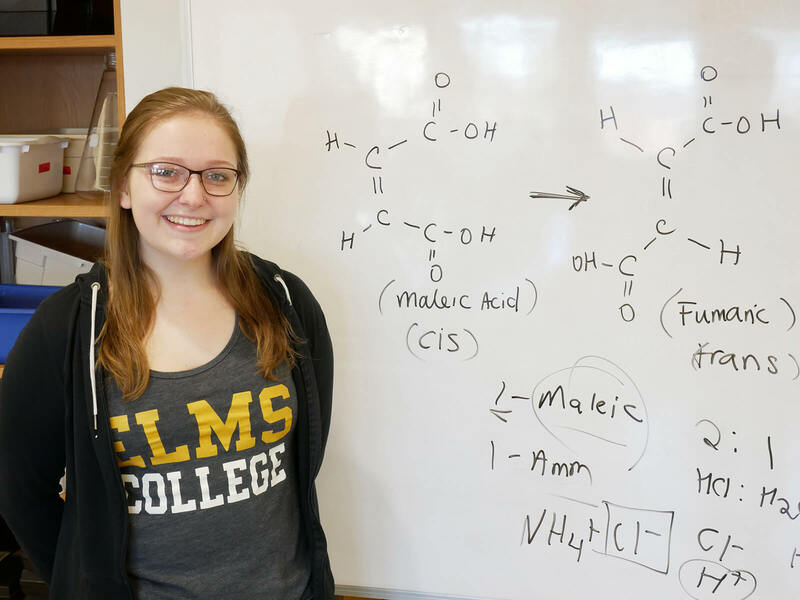 Chemistry majors at Elms College develop an in-depth understanding of organic and inorganic matter. As a chemistry major, you will look below the surface of things, studying the properties and interactions of atoms, molecules, subatomic particles, and more. Our program encourages you to consider the theory and application of chemical science, whether you are interested in organic, inorganic, or physical chemistry. Our award-winning faculty help you cultivate your talents in the classroom and lab. Small class sizes mean that you go beyond simply learning about molecular structures and chemical compounds. Instead, you’ll be challenged to interrogate concepts that are central to chemistry, examining them through independent research. Faculty often invite majors to collaborate with them on ongoing studies as well. Students in our program have full access to the Lyons Center, a $12 million facility equipped with spectrophotometers, chromatograms, electroanalytical equipment, and radiometric instruments that enable innovative STEM research. The beauty of earning a chemistry degree is that it can take you anywhere. Chemists apply their skills to everything from improving the durability of plastic polymers to enhancing the flavor profile of your favorite snack or drink. Work in the private sector. If you’re interested in developing practical uses for scientific research, working in the business industry might be your calling. Biotechnology, pharmaceutical research, and biomedical engineering are just a few of the industries where chemists make a difference. A thorough understanding of chemistry can also pave the way to careers in the health professions. Work for a government agency. If you want to use your degree to serve the public, you might consider working for a government agency, public health institute, or think tank. Chemists provide valuable scientific insight to issues concerning public health, public policy and legislation, environmental stewardship, and hazardous materials management. Work in education. If you see yourself teaching students about the periodic table, chemical reactions, and biochemistry, a double major in chemistry and education is the career track for you. Colleges and universities offer the opportunity to conduct original research while teaching students more advanced science. If you feel called to find a job as a professor, our master of biomedical sciences program is a good place to get acquainted with the rigors of doctoral research. Work for a nonprofit. You can also use your knowledge of science more holistically, advocating for a specific cause that you believe in. The liberal arts courses you take along with your chemistry requirements teach you to put science into context, making it relatable to non-experts. Our bioethics and medical humanities minor is one way to expand your skill set, prompting you to engage with the ethical and moral aspects of medicine, technology, and pharmaceuticals. Recent graduates of our program have gone on to do great things. Some are pursuing a Ph.D. in programs at Brown University, University of Massachusetts Amherst, University of Connecticut, and Boston College. Others have found jobs as chemists at local companies, including Solutia, Morton Salt, and Minute Maid. Many graduates have chosen to pursue teaching careers as well, often finding positions in high schools in Western Massachusetts. Conduct original research in the Lyons Center, a state-of-the-art research facility. Gain hands-on experience with organic, inorganic, and physical chemistry, and connect your studies to fields like applied mathematics and computer science. Benefit from personalized instruction and small class sizes. Connect with faculty about career development. Explore extracurricular opportunities in Western Massachusetts. 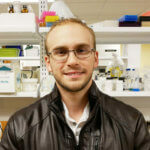 Before he came to Elms, Kyle didn’t have any formal experience with research. That all changed, however, when he began assisting Professor Janet Williams with a study during his freshman year. Now, the biology and chemistry double major says that he’s gaining valuable experience researching the viability and efficiency of probiotics. Kyle is also the recipient of the Freshman Chemistry Achievement Award, which recognizes academic excellence by the top-ranking freshman enrolled in general chemistry.